Soft and silky smooth, yet strong and resilient, this ultra light-weight tissue paper is 30 inches by 20 inches and only 12 gsm with a beautiful deckled edge. 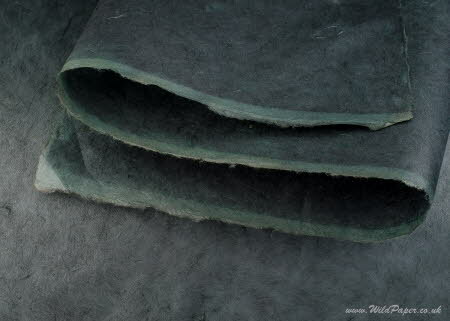 This natural lokta paper is made entirely from lokta fibres dyed to black. This does not appear as black as the Ebony Black gift wrap paper because the paper is very thin and semi-transparent. It is suitable for wrapping delicate and valuable presents or used for art and paper crafts (pack of 3 sheets). Supplied rolled in tube in packs of 3 sheets. Price is for a pack of 3 fine quality rolled sheets (20" x 30"each). Each sheet has deckled edges on 4 sides, with the variations typical of handmade papers. The paper and colours may vary.